Reading for Speech: Two Manhattan speech pathologists, Lavinia Pereira and Michelle Solomon, have created a series of adorable, accessible children's books aimed at helping very young children develop their speech skills. The books, which have names like, "Oh! A Bubble..." and "Block On Top" would be fun and helpful to share with any child (roughly 16 months and up) as he or she takes on the challenges of pronunciation--but the series would be especially helpful, of course, for children with speech delays, motor speech disorders, autism, cerebral palsy, and other illnesses that impact speech. Pereira and Solomon have called their wonderful project "The First Sound Series," and they have eight books and counting. For more info, see www.firstsoundseries.com. 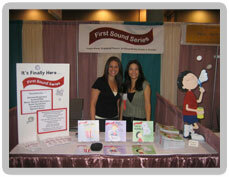 First Sound Series debuted at the ASHA convention in Miami Florida in November 2006. It was a pleasure meeting so many colleagues from around the country. Thank you for all your support and we look forward to seeing everyone in Boston 2007. The authors of First Sound Series held a book release party/fundraising event in New York City on December 5, 2006. Thank you to all the parents, colleagues and friends who attended and shared their support. It was an amazing evening! Apraxia-Kids.org Newsletter: Featured Article February 2007. 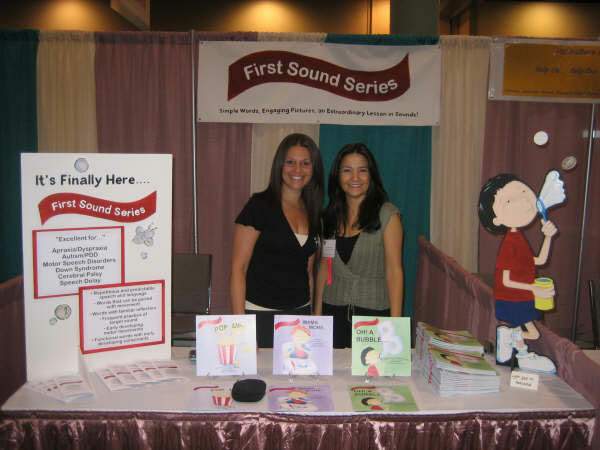 Repetitive Books: An Effective Therapeutic Tool for Children Diagnosed with Apraxia of Speech. First Sound Series has teamed up with smartalk.info . Please visit smartalk.info for more information and materials that can be used in PROMPT therapy. First Sound Series was a featured product on Therapyscoop.com!! Visit Therapyscoop.com to read the review and experience the online interactive community for therapists and caregivers.